Is there an age restriction to attend screenings at FilmBar? Anyone 18+ can attend screenings at FilmBar! Those under 18 are always allowed into FilmBar as long as they're accompanied by a parent! Our General Admission tix are typically just $9.95! Ticket prices will vary from time to time for our short-run or special-interest films. Do you have your own parking lot? Yes! We have 17 of our own parking spaces adjoining our building. If those are full, there's plenty of metered street parking nearby. Meters accept change and credit cards. Do I need to buy a ticket to grab a drink at the bar? Not at all! You can just swing by for a drink, if you’re not in the mood for a film (it happens). We’ve got a present for you! Come on down for a free ticket to a show on your birthday (or within a few days either side of it)! FilmBar currently has only 76 seats, so we highly recommend buying your tickets through our web site – especially for Friday and Saturday nights! Quick answer? Food: yes. Drinks of any sort: no. We're very happy to refund pre-purchased tickets, as long as we receive your refund request 2 or more business days before the start of the showtime the ticket is for. 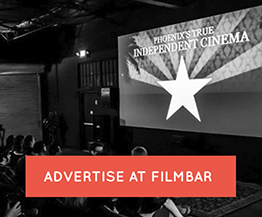 Please email us at: info@thefilmbarphx.com when requesting the refund, emails sent after 4pm Friday will be answered the following Monday. Please include the name of the purchaser, the date/time/film name of the screening in question, and the last 4 digits of the credit card used to purchase the tickets.